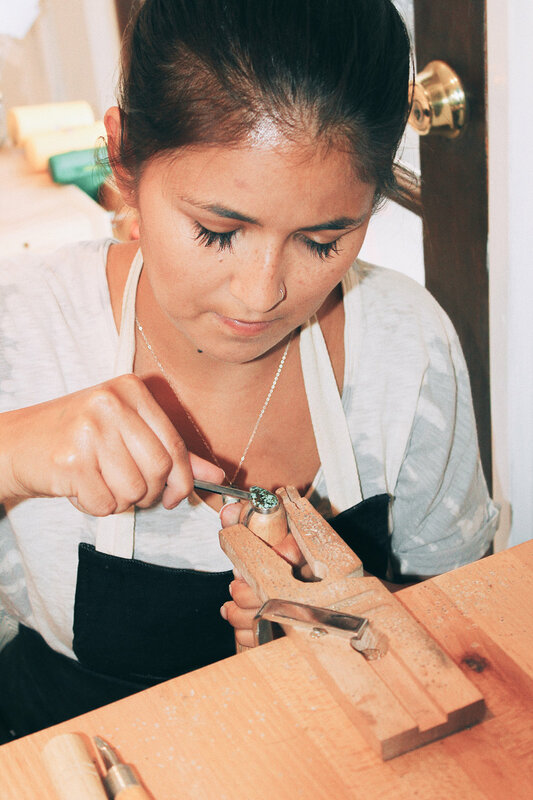 Meet Jenny Rodriguez, the sweet woman behind our newest jewelry in the shop. When Jenny and I first crossed paths, I didn't even need to see her work to know that I would love it. Her heart and soul bleeds through into her designs, and I'm honored to have her beautiful jewelry in our little shop. She graciously agreed to do a "meet the maker" interview for us. Head down below to get to know this lovely artisan! The basics. Jenny Melissa Rodriguez; Mesa, Arizona (within the Phoenix area); Owner & Jewelry Designer for my company, Pure Life Jewelry, and I also help run the marketing and bookkeeping part of my parent's business. Describe yourself, your art, and the story of how your passion/business came about. I'm definitely a huge optimist and try to see the good in every situation. I really love the beach, beautiful weather, traveling, adventures, good music, art and ridiculous amounts of coffee (we're with you there, Jenny!). I was born and raised in Arizona, but I will forever be a beach bum. My jewelry is a reflection of my ideals in how we should all follow our passions and crazy dreams. I believe that you should travel, see the world, and not give into what you think society wants you to do. The name of my company mirrors a popular Costa Rican saying "Pura Vida!" and it directly describes my vision for Pure Life Jewelry, as a symbol of living life to the fullest. I was raised with the notion that you should always live courageously and live a life of passion and meaning. For me, making jewelry is not a job or just a business; it is my small way of contributing to your story and journey. I have always loved making jewelry, even as a kid I was making beaded bracelets and selling them to my mom's friends or setting up a "little store" outside my house to sell friendship bracelets. I've always had an entrepreneurial spirit. As I got older, I took my jewelry passion further by enrolling in metal-smithing classes and I instantly fell in love. There is just something about creating from your own two hands that fills my soul. So finally I decided to leave my full-time job and really focus on my company. I work part-time with my family where I help with their marketing, and focus on my jewelry the rest of the time. What are you currently working on? I am working on busting out my fall line! I am so stinking excited about launching it. Right now i am focusing on incorporating more gold-filled pieces. Some of the pieces will be adorned with beautiful lapis stones and fun geometric shapes. Describe your workspace. My workspace is in my home. I was blessed enough to find a place that has a perfect room for a studio. It was converted into a room by the last owner; he used to run his chiropractic business from home. I even have my own separate entrance! It's so perfect, with lots of lighting and I get a view of what's going on outside. It's my home away from home. Please share a little bit about your creative process. The process of creating jewelry is my absolute favorite. 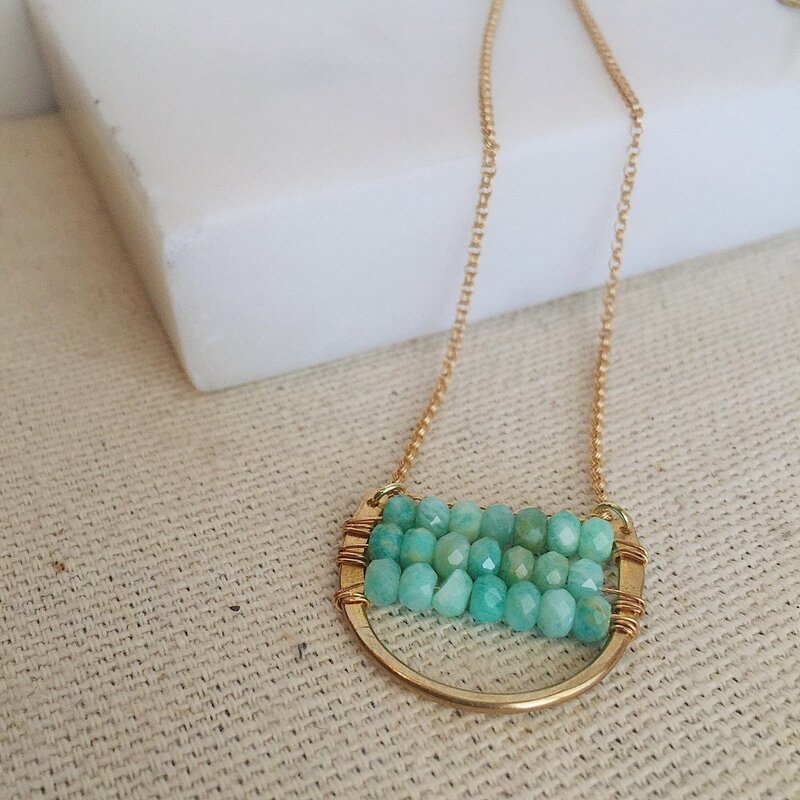 It's so fun to see how an idea evolves into an actual piece of jewelry from a mere sketch. I usually start a piece by sketching what I want it to look like, then refining the structure to be more feasible. From there, I find stones that go along with the design and will compliment the piece. Then I create a sample piece and wear it out, test its durability and if it passes the test, then I work on creating other styles that compliment the colors and the piece. I always try to base a collection off of color. For me, that usually helps with creating a more cohesive line. How do you begin your mornings? I love to take my mornings slow. I usually wake up pretty early, make some coffee, chill with my pup, Tuffy, and plan out my day. When it is not super hot outside, I love to sit on my porch and enjoy the outdoors for a bit. Since I work from home most days, I like to be able to begin my morning outside. What does a typical day look like for you? Most days I focus my morning on following up on emails, working on marketing, etc. Afternoons are spent working on orders and packaging them. I try and run any errands in the afternoon as well because traffic in Phoenix is not very fun to sit in during rush hour. Once 6pm rolls around, I try and wrap up as much work as I can. That doesn't happen all the time but I try to be good about it. Anything tech-related that stimulates my brain, I shut off. Evenings are usually when I spend time with my boyfriend, family or friends. I think stepping away from your business and technology completely at night is important. It helps with the balance of owning a business and enjoying everything else. What inspires you on the daily? Daily, I am inspired by the creative community in Phoenix. Everyone is so incredibly talented, it really pushes me to strive for excellence. I am also very inspired by music. I always have been. I love hearing of new bands or collaborating with friends on creating a fun playlist. Where do you hope your business is five years down the road? In five years, I would love to 1: Be focusing on my company full-time, 2: Own a traveling jewelry boutique and 3: Still fulfilling my dream of spreading my vision for Pure Life Jewelry, as a symbol of living life to the fullest. For me, making jewelry is not just a job or business, it is my small way of contributing to my customers' life journey. Shop our selection of Pure Life Jewelry.